On Twitter, user @DivaQBBQ says "This could very well be one of the worst written Kijiji ads that I have ever seen." 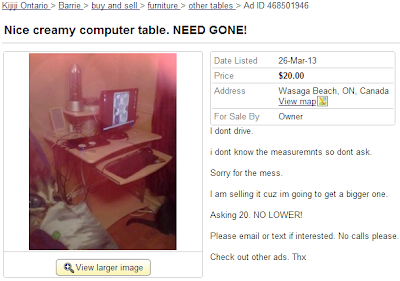 Nice creamy computer table. NEED GONE! i dont know the measuremnts so dont ask. I am selling it cuz im going to get a bigger one. Please email or text if interested. No calls please. How bad is the picture? This bad. Did someone put this through Instagram or did their camera go through the washing machine? You can almost imagine the stink and stickiness that must come with this table. And it's creamy.